Update, June 4: For our own detailed analysis of Obama’s spending — in which we disagree in part with Nutting — see our June 4 featured article titled “Obama’s Spending: ‘Inferno’ or Not?” We found that President Bush was responsible for most of the sharp rise in spending in fiscal 2009, which began before Obama took office. And we found that spending has risen since then more slowly than it did under Bush. But we also noted that spending in fiscal 2010 and 2011 remained at the highest levels since 1946 when measured as a percentage of the nation’s economic output. Fact: Actually, this woman (who tells us she is still working) would have benefited from tax cuts sought and signed by Obama. If she’s making $50,000 a year, the most recent cuts in payroll taxes would have been worth $1,000 to her both last year and this year. 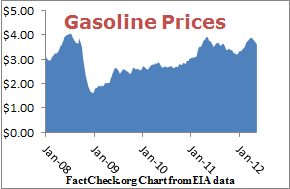 In fact, the national average price for regular gasoline hasn’t been as high at any time under Obama as it was briefly under Bush, when it topped $4 a gallon for six weeks in the summer of 2008. That’s still a record, as measured officially by the U.S. Energy Information Administration.